ClassicRiser Standing Desk Converters - 27"
The design of the DXT 2 Mouse enables the hand to work from a relaxed position reducing the tension on the soft tissues. In addition the vertical design avoids extreme twisting of the forearm helping to increase comfort. Similar to a pen grip the DXT 2 design allows for accurate navigation. Small muscles and joints of the fingers have higher processing abilities for movement and sensation than other larger body parts. The large muscle groups of the shoulder are adapted for power and larger ranges of movement whereas the smaller muscle groups of the hand are adapted for finer, precise movements. By pressing a single button the DXT 2 instantly switches between right and left handed use. It does NOT require primary button function change in the Operating System, regardless of left or right handed use. 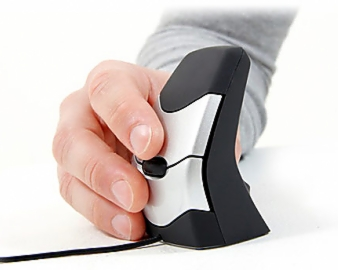 This unique feature allows the user to spread the mouse usage throughout both right and left hands with relative ease. 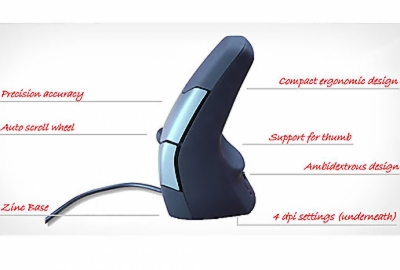 It also enables users with an injury to the dominant hand to easily switch to their non-injured hand and continue to work effectively with minimum impact on productivity. 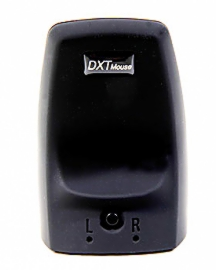 The DXT 2 Mouse’s unique compact design fits a large range of hand sizes. 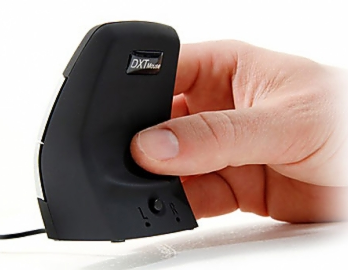 Unlike other ergonomic mice the DXT 2 Precision Mouse’s compact design is ideal for laptop and travel use. Accommodates both large and small hands. Start by placing the tip of the ring finger over the black plastic triangular area beneath the bottom click button. The remaining finger tips and thumb will naturally position themselves on the first half of the front and back mouse surfaces, respectively, with the pinkie finger tucked in. The fingers should be comfortably curled (e.g. holding a pen) versus extended or lying flat. The resulting hand and finger posture facilitates precision movements and avoids the fingers being placed one upon the other and coming into contact with the cable. It should be noted that the body of the mouse is not placed parallel to the side of the keyboard but at an angle to the side of the keyboard. Optical Resolution: 500, 1000, 1500 & 2000 dpi.